Springfield, 37, started playing music on a 4-string, but not the one you'd expect. It was his dad's Gibson banjo ukelele. Seeing a rock band at school during his early teens prompted him to pick up a different 4-string  a Silvertone bass. Studying the bass lines of Verdine White and Rocco Prestia helped him to cultivate his chops. He later attended Berklee College of Music in Boston to study jazz with Bruce Gertz. After Berklee, Rusty played with such jazz artists as guitarist Charlie Byrd, and saxophonists Richie Cole and Bill Evans. He also played the Montreux Jazz Festival in Switzerland and was in the house band at DIsney World. So how did he end up with the circus? "In 1990 I got a call from a friend in LA," he explains. 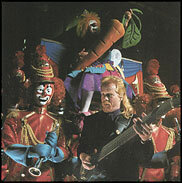 "He had played with the circus before and said they needed a bass player. Being a jazz guy I thought it was a prank  it was like, 'Yeah, right, me play with the circus!' So I called them, found out he was serious, and jumped on a plane for Massachussets, where the show was playing. The audition lasted about an hour and ran through the tunes for the show  I read the charts, told a few good jokes, and they let me stay." With his Silvertone long retired, Springfield's main axe is a bit unusual. It's a 7-string (tuned B-E-A-D-G-C-F) that was custom-built by the Guitar Factory in Orlando, Florida, and spans nearly a 5-octave range with 28 frets; the bass is fitted with EMG-DC humbuckers and a Kahler bridge. Rusty's amplification is all ADA: an MB-1-MIDI preamp and a B500B power amp, which power two ADA Bassline HX 2x10s. An Alesis Quadraverb provides chorus. How much longer will his life be a circus? "I can't really say," says Springfield. "Id love to play in a Bela Fleck-type of band -- something where the music is challenging and I get a moment to shine. But the circus is steady, and I can't see myself going back to playing bars for $50 a night!" After playing with the Greatest Show on Earth, who could?